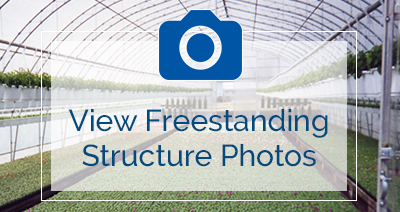 The competitively priced OMNI FREESTANDING greenhouses are designed with superior strength and dependability in mind. Welded reinforced arches provide maximum wind and snow load protection with standard 6′ arch spacing or optional 4′ arch spacing for extreme weather load conditions. The prefabricated slip fit trussed arch design with pre-drilled holes provides a superior strength frame while simplifying assembly and shortening construction time. Omni’s unique 4′ high straight sidewall and open span design give you optimum unobstructed space in the interior of the structure which allows for convenient placement of mechanical systems as well as hanging basket production. Framing is made of heavy 16 gauge x 1.5″ rd. galvanized tubing. Every arch is completely reinforced from ground to ground for superior strength and durability. Gothic peak profile provides maximum headroom while reducing the chance of snow build up at the peak. 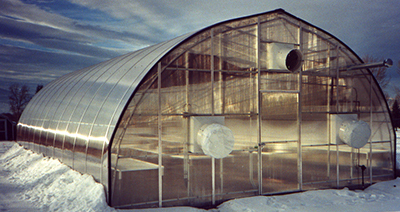 Unique poly-saver ridge system eliminates poly wear at the peak where poly film is stressed the most. Slip fit arch connections and pre-drilled holes allow the structure to be easily assembled with minimum effort. Purlins fasten onto the inner arch to reduce condensation drip and also serve as built in plant hangers. Reinforced 4′ high straight sidewalls offer maximum headroom. Standard 6′ arch spacing with optional 4′ arch spacing available. 4mm white polyethylene film, UV protected, seasonal rating. 6mm clear polyethylene film, UV protected, 4 year rating, single or double poly layers for added insulation. Rigid 8mm twinwall polycarbonate panels, clear, UV protected, high impact, 83% light transmission, 10 year rating from manufacturer. Rigid 8mm twinwall XL panels, translucent, UV protected on both sides of panel, 77% light transmission, 10 year manufacturers rating. Every arch is completely reinforced from ground to ground thus providing superior strength and durability. Omni’s unique slip fit arch design allows our Freestanding structures to be easily assembled with minimum effort. Condensation drip and snow pocketing due to purlin contact with the poly film is eliminated by offsetting the purlins to the inner arch. Gable arches with pre-installed wirelock track enables quick assembly and provides a positive means of securing both roof and end wall poly layers if required. Gable arches are available with U.V. stabilized rubber closure which provides an excellent seal over the exposed edge of the end wall claddings up to 1″ thick. 8mm twinwall polycarbonate coverings offer maximum thermal insulating value and are easily attached to the arch frame thus upgrading your structure to the best in both durability and design. Aluminum baseboards provide a secure and convenient means of fastening single or multi layer poly film coverings. Gable End Wall Framing is available for all models. Framing members are 1.5” sq. galvanized tubing that has been pre-cut to the required lengths.